I will never forget the day. I was in the 5th grade. I still remember coming home from school and my mom telling me that the local baseball little league had called, and that I had been placed on a team without a coach. She then proceeded to tell me that my dad had stepped up to the plate and offered to coach the team. I was elated. Not because he was going to be my coach, but because I knew that my dad had a lot of demands on his time, and he was choosing to be with me. Seven years ago I found myself as a father of 4, and soon to be 5, with no job, living in a new town. Not only was it stressful picking up freelance work to pay the bills with the help of welfare, but it was also apparent that one of my children was having a difficult time making and keeping friends at school. 1) Make sure my family’s basic needs were taken care of and, 2) find a place where my children could make and keep friends. The way I saw it, neither was a short-term solution. So I sought out service in two ways: 1) Professionally within the marketing community, and 2) At the local recreation center that sponsored a sport my child was interested in, water polo. I also happen to love the sport. The initial reason I volunteered professionally was because I struggle to network, and I knew that by volunteering, it would help me break the ice with those whom I desired to know. The hope was, that by association, I would be able to gain employment. I also knew that by helping the recreation center build a water polo program, my child, and all my children, would have a place to make and keep friends for life. After 4 years of volunteering with the Utah Chapter of the American Marketing Association I had served as Vice President of Marketing, Chapter President and was nearing the end of my first year as Immediate Past President. I had met amazing people, accomplished many lofty goals and had the pleasure of being part of an organization that had experienced substantial growth. During my year as Past President, the current President had began to let things fall apart. I had done a poor job of preparing him for the commitment that was required. By all measurements of success, that year had been a failure. I was asked to take on the role of President one more time and lead the chapter back onto the track of success. I had no idea what this organization meant. I thought it was simply networking and learning. Little had I known it also meant eating and living to some. I knew I could get it back on track, and by doing so, help even just one person. As I looked back on the previous three years, I counted a number of people whom the chapter helped gain employment, grow their business and learn new skills that helped them receive promotions. As a direct result of the service by those who led the Utah AMA (it was not just me, but dozens of volunteers) many lives were made better. Was it worth the sacrifice of my time, to know that people were being fed, bills being paid, and lives being improved. Of course it was. In fact, my life over those three years had not become more well off economically. But I had discovered a new way of finding fulfillment. When I first started coaching water polo, our program was unstable. I don’t think most of the kids parents even knew they played the sport. For three years we consistently had about 15 boys and 8-10 girls. Getting to a 30 kid program was our lofty goal. In the fourth year we had a coup. Two of the eight girls (seven play at a time) decided to play for a different club. Not only that, but these girls also told the others and many of the boys that there was no longer a water polo program and were recruiting others to leave our club. Not everyone could go elsewhere to play. It was simply too far. So that year we hustled and hustled and somehow managed to put together a girls team. Our boys team was slightly smaller than we had hoped, but we had a boys varsity, boys JV and girls varsity team. The 5th year something changed. I don’t know how, but our program grew to 40 kids, and then 50 in the 6th year, and now we have 60 in our 7th year. This past weekend I created 6 rosters. Three teams for each gender. After one of the two tournaments we played in this weekend, one of the parents came to me and thanked me for my time that I invest into the program, and how much it means to her, her husband and their daughter. Rarely do I get thanks for my time. I spend a lot of time, un-paid, and I rarely get a thank-you. But I don’t do it for the recognition. You see, one year I got a Facebook message from one of my players detailing the depression they had and how they dealt with it via cutting themselves on the wrist with razor blades. Another day, I learned another player had come to the program under suicide watch. This player came to us with no hope and no friends, but by the end of the season had a whole cheering section of fans and teammates. Once I heard from other players how one family had left an abusive father and the water polo family they had gained, had become a significant source of strength to one of the children who played for us. Originally, my goal was to provide a place where my kids could belong. I achieved that goal. But what I did not know, is that I was doing that for other children as well. My kids, they have it made now. They have the best friends a parent could hope for. Goal #1 has been accomplished. But I stay. Not because my kids need me. But because when I give my time, and I see the impact it has on others, I know this is one of the best ways to spend my time. That day Christ redefined greatness. 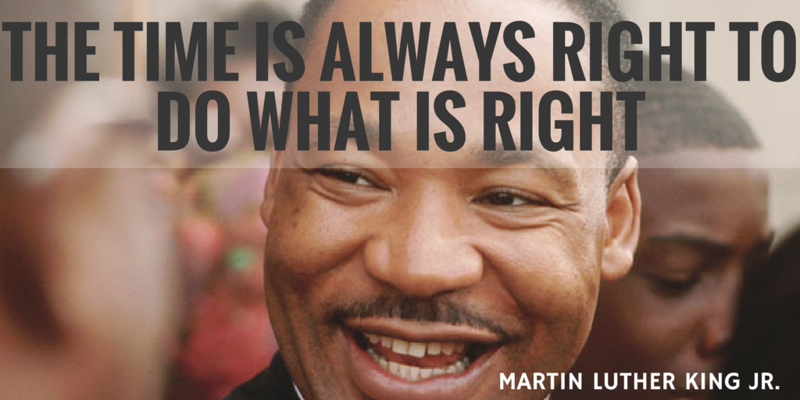 The late Dr. Martin Luther King Jr gave a fantastic sermon on this. The name of the sermon is called, “The Drum Major Instinct.” In short, the instinct is the desire most of us have to be great and recognized for that greatness. Dr. King goes into great detail about why we have this instinct and the dangers of it. But he also goes into great lengths why it is also a good thing. I want to quote a significant part of his sermon right here, and then conclude my post on the topic of service with what I have truly gained. “…by giving that definition of greatness [ Jesus to his Disciples], it means that everybody can be great, (Everybody) because everybody can serve. (Amen) You don’t have to have a college degree to serve. (All right) You don’t have to make your subject and your verb agree to serve. You don’t have to know about Plato and Aristotle to serve. You don’t have to know Einstein’s theory of relativity to serve. You don’t have to know the second theory of thermodynamics in physics to serve. (Amen) You only need a heart full of grace, (Yes, sir, Amen) a soul generated by love. (Yes) And you can be that servant. Nineteen centuries have come and gone and today he stands as the most influential figure that ever entered human history. All of the armies that ever marched, all the navies that ever sailed, all the parliaments that ever sat, and all the kings that ever reigned put together (Yes) have not affected the life of man on this earth (Amen) as much as that one solitary life. His name may be a familiar one. (Jesus) But today I can hear them talking about him. Every now and then somebody says, ‘He’s King of Kings.’ (Yes) And again I can hear somebody saying, ‘He’s Lord of Lords.’ Somewhere else I can hear somebody saying, ‘In Christ there is no East nor West.’ (Yes) And then they go on and talk about, ‘In Him there’s no North and South, but one great Fellowship of Love throughout the whole wide world.’ He didn’t have anything. (Amen) He just went around serving and doing good. Every now and then I guess we all think realistically (Yes, sir) about that day when we will be victimized with what is life’s final common denominator—that something that we call death. We all think about it. And every now and then I think about my own death and I think about my own funeral. And I don’t think of it in a morbid sense. And every now and then I ask myself, ‘What is it that I would want said?’ And I leave the word to you this morning. I’d like for somebody to say that day that [James Keddington], tried to love somebody…. When my parents or wife or neighbors ask why I give so much of my time to my fellow professionals or to the water polo program, it is usually in the context of telling me that I am amazing and incredible. I always get uncomfortable. I don’t see it that way. My mind quickly goes to the sacrifices my dad made for me when I was in little league, and how it created an amazing bond between us. In fact, it is probably the reason we had a bond at all. I want that between me and my children. The one thing we all have in common that we can give time and effort. As the years have passed I have grown beyond doing things so I can get a job or make my children lives better. Neither of those are bad either as a starting or ending place when it comes to reasons for volunteering. But as I see how lives are changed when we serve others, I see how much we all are capable of. Every day I am inspired by those I am surrounded by. Their courage, their faith, their discipline and commitment inspire and motivate me. But most of all, I learn to love them. I love them because I know and see them as God knows and see’s them. I get a glimpse into how God knows and see’s me. It draws me close to my Father in Heaven and my Savior Jesus Christ. You don’t need to be the AMA President or Club Manager to benefit. Any kind of service creates intrinsic reward. Any kind of time given yields opportunities to love and feel love. Any effort makes life better, for everyone. I feel blessed. The rewards of service far outweigh the opportunity cost of doing something else. I challenge you to give 30 minutes of your time this week to someone, or some organization in need. Don’t look for the reward. Don’t look for the thank-you’s. Don’t see what comes to you. But pay attention to what is really provided to others. Watch for how lives are altered and made better. I promise you, it will be worth it. So what are you waiting for? Go, and do good.